Download starts when you click on the title ! Please try playing with printed on paper. Family Anime Festa 2016 Post-Event Report! Family Anime Festa 2016 Concluded with Great Success! Attendee Count Hit a Record High of 10,325, an Increase of 2.6 Times Than Last Year! News on Stage Corner！　This corner is full of all kinds of fun! 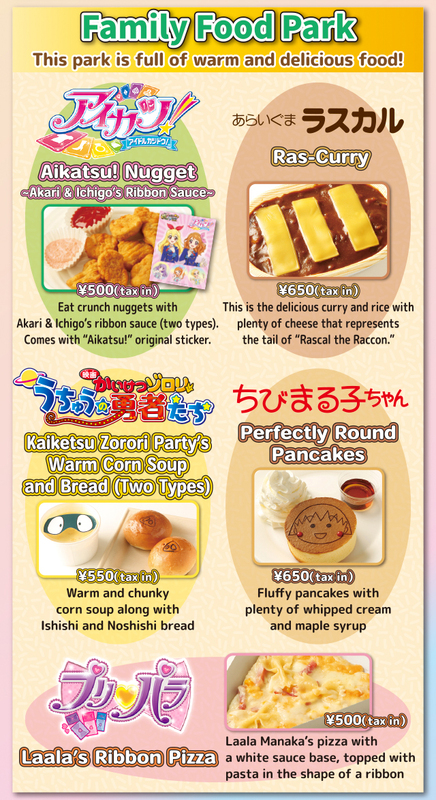 News on Food Menu！　This park is full of warm and delicious food! 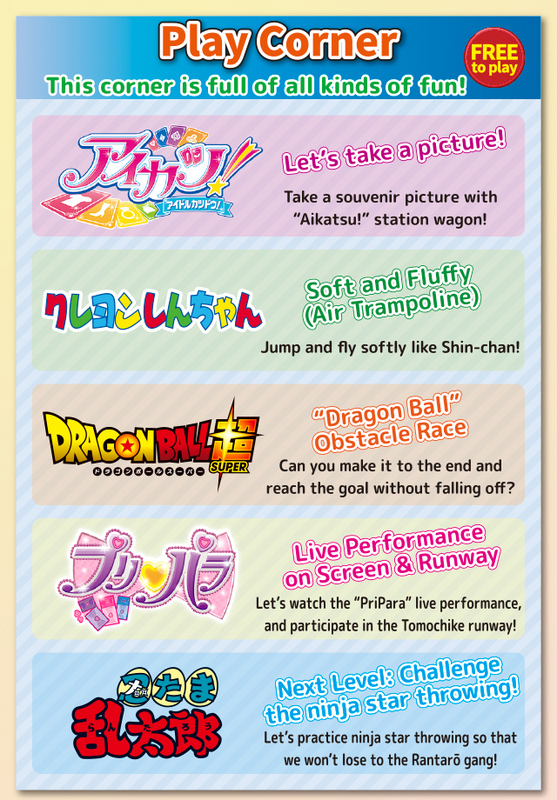 News on Participants！　ANIME CHARACTERS ARE COMING! News on Exhibiting Booth! Fun Booth are waiting for you! Family Food Park is ready! Kids Workshop Corner is coming! Family Anime Festa 2016 official website is here! Presenting the new TV animation series “Mysterious Joker” to be telecast from April! Welcome to a spectacular night! Come see "MYSTERIOUS JOKER" at the Family Anime Festa ! Check out the 3DS game software corner and you might catch a glimpse of Joker!? Come, check the latest information on the TV animation series “Age 12” to start from April! From among the Shogakukan “Chao” television series, the hugely popular TV series “Age 12” to be made into an animation series. Come and check the latest information and get video glimpses of the series in advance of the telecast to start in April. “That” hugely popular character may also the grace the occasion, so, come one, come all! Whoa! It pops up and has sound effects too! Come be part of the new sensational coloring experience! A new sensation of coloring experience. “Tantei Team KZ Jiken Note” DVD launch commemoration! In collaboration with MKB! 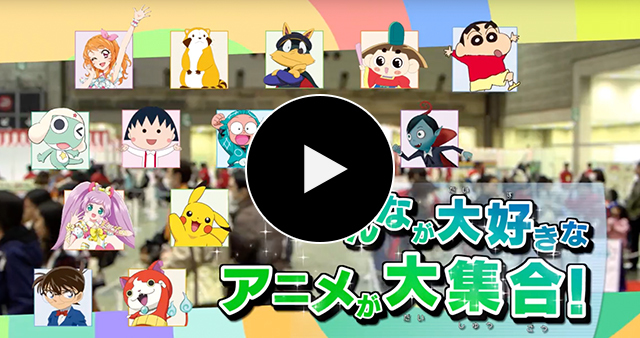 24-hour broadcast ranging from popular, blockbuster, and classic anime series to original children’s programs! What is Family Anime Festa 2016? Family Anime Festa 2016 is a sister-event of AnimeJapan 2016, hosted by the same organizer. It takes place on March 26 [Sat] – 27 [Sun] 2016 at the East Exhibition Hall 6, open only for family attendees. Any attendee that is at elementary school age (and under) and their guardians are free to enter. Please come in through family-only admission gate. *For attendees over middle school age to enter AnimeJapan 2016, admission ticket for AnimeJapan 2016 is required. 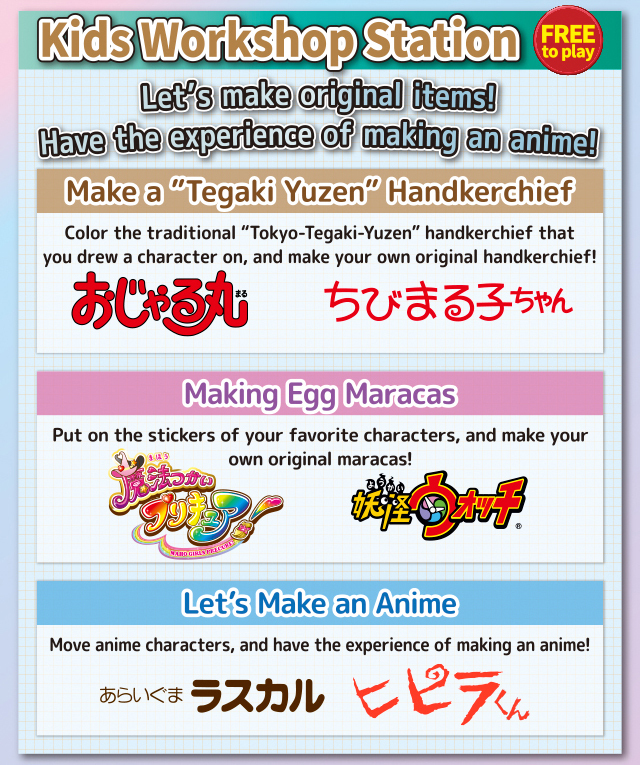 What kind of programs do Family Anime Festa 2016 offer? We have anime contents that are dedicated for families and kids. How much is the admission charge? Admission to Family Anime Festa 2016, for elementary school age children and their guardians, is free. *No admission tickets needed. 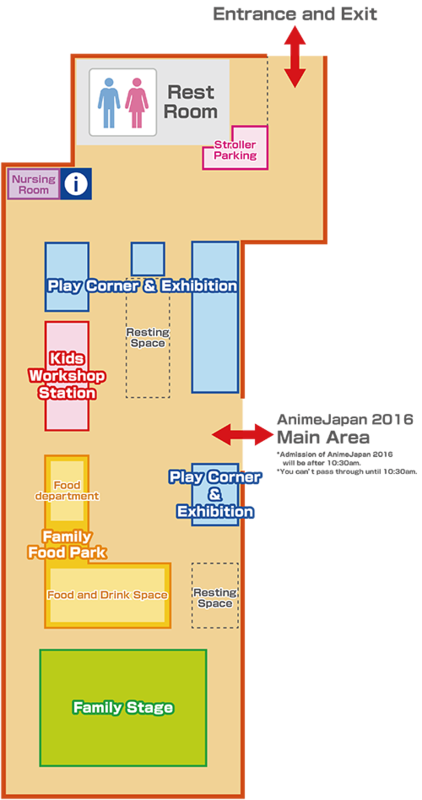 *Admission to AnimeJapan 2016 is free for elementary school age children and under, and no admission tickets needed. Their guardians, however, will be charged. Is there a specific admission gate? Family Anime Festa 2016 has its own admission gate that leads directly into the venue. *Admission is limited to elementary school age children and their guardians. Can I bring my stroller inside the venue? Yes, you can. However, the venue will be very crowded, so please be careful when walking around with it. Family Anime Festa has its own stroller parking space. Are you renting a stroller? We are sorry but we do not offer that service. Is there a place I can change my kid’s diaper? There is a diaper changing space in female restroom. Is there a nursing room? Yes, Family Anime Festa 2016 has its own setup nursing room at the venue.